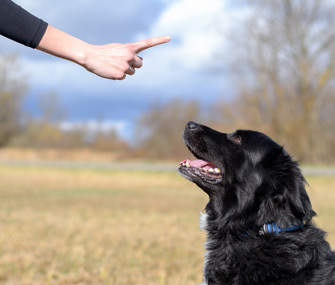 Even if your dog isn't deaf, it's always a good idea to teach him hand signals in addition to verbal cues. One of the sweetest things about my profession as a veterinarian is the opportunity to see the love shared between people and pets. What’s even more special is seeing the accommodations people make for pets with disabilities. Deafness is a common disability in dogs and cats. Puppies and kittens can be born deaf, or pets can become hearing-impaired with advancing age. White cats and dogs with merle, piebald and white markings can be more prone to deafness. In every case, these pets have special needs when it comes to communication. Here are some tips to help you get your deaf pet’s attention and let him know what you want. Whether or not your puppy or adult dog is deaf, I think it’s always a good idea to teach a dog hand signals in addition to verbal cues. You never know when you are going to need to communicate silently with your dog. Hand signals are a way to do that. They can also come in, uh, handy should your dog lose his hearing. Cats can learn hand signals, too, and respond to the same training principles. Heck, sometimes they’re even better than dogs at picking up visual cues! Learning hand signals for behaviors such as sit, down and come will stand your pet in good stead throughout life, ensuring that you will always be able to communicate with him. Because they are so observant, many animals respond well to hand signals, more so than to verbal cues. Common hand signals include a raised hand for stop, a hand moving upward for sit, a hand moving down and back for down, and a hand across the throat for quiet. My daughter, dog trainer Mikkel Becker, likes to use a hand clap or a thumbs-up to give a pet the message “good job.” To confirm that you’re pleased, follow the good-job signal with a treat, petting or favorite toy. You can even teach your dog or cat sign language. I love this video that Mikkel shared of a young girl who is hearing-impaired and taught her hearing-impaired puppy, Walter, sign language. Among the American Sign Language words Walter learned to recognize are "sit," "water" and "food." Another one that any dog will love to learn is the sign for "walk." Gestures for “dinner,” “car” and “outside” can also be also useful.